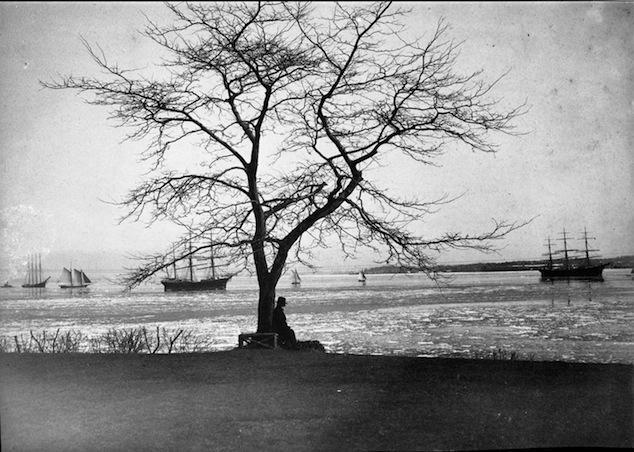 Elizabeth Alice Austen (March 17, 1866 – June 9, 1952) was an American photographer, a pioneer of photography in many fields. Surely many of you already know her, for some others it will be a discovery, as it was to me; although I already knew her, I am still amazed at the liveliness of her legacy. Each time I review her figure I discover something new, I hope you enjoy her the same way I enjoyed. On a sloping hillside overlooking New York’s Verrazano Strait is Clear Comfort, a charming early 18th-century farmhouse that was transformed from a humble farmhouse into a comfortable Gothic Carpenter-style mansion, the unique North American architectural style that adapts European Gothic style to wood constructions. That house is today the home of the Alice Austen House Museum as Alice Austen House grew up and lived there until she was evicted, this amazing photographer whose work was nearly lost, although it was never completely forgotten, until the end of her life when she was rediscovered; there she learned and experimented with photography in an almost self-taught way since 1876. When Alice was 10 years old, her uncle Oswald Muller, ship’s captain, brought a camera from one of her trips. Oswald taught him how to use the camera and his other uncle Peter, a chemistry professor, how to work with the products to develop glass plate negatives and make paper copies. 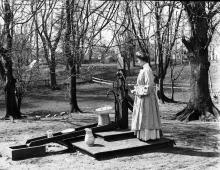 There was no running water in the house, so Alice washed her photographic prints at the garden water pump. Between the hustle of boats passing by the bay and the wide gardens of the house, Alice developed her hobby. At the age of 18, she was already an expert in the field, mastering light and composition, as can be seen in the exquisite plaques of the interior of the house or those of the twilight facing the sea. Alice photographed tirelessly the landscape and the countryside around her; the life of a carefree high society in which gatherings of family and friends playing tennis, bicycle rides, beach picnics, fancy dress parties, teas, or her dog Punch filled the hours of the day. That was Alice’s world, a playful universe, in which the main concern was how to spend all the free time. Within all this hustle photography was part of the game, and although we are among the New York high bourgeoisie of the late nineteenth century, in a country where there were already rollfilm cameras, the photographic act was something new and exotic, and both Alice and her models let themselves into it with an enthusiastic complicity. That which now, after all these years, astonishes us and thrills us. This “darned” club was not a place, it was not a Staten Island ladies’ club as some online reviews indicate; “The Darned Club”; it was, initially, the title of a photograph, one of the most famous of the Austen collection. According to Alice’s note “… that’s what the boys called it”, boys who didn’t understand friendship between women, the affection and complicity that they showed each other, and that is how they called, in a derogatory way, their group of friends; the four that appear in this photo: Alice herself, Trude Eccleston, Julia Marsh and Sue Ripley. 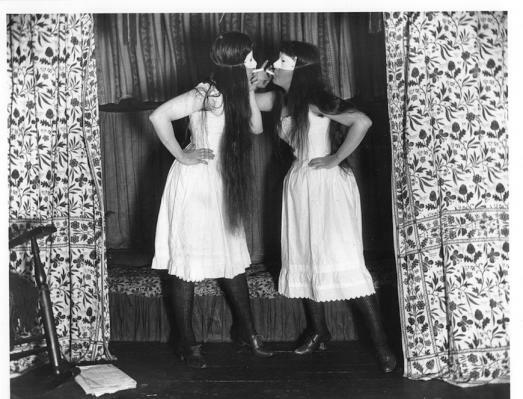 Trude Eccleston appears in another curious photograph of Alice: “Trude and I” in which the two of them are smoking, in petticoats and wearing masks. Note from Alice: “We were probably in a terrible state that day, we didn’t have much idea what smoking was, but we thought it was elegant. 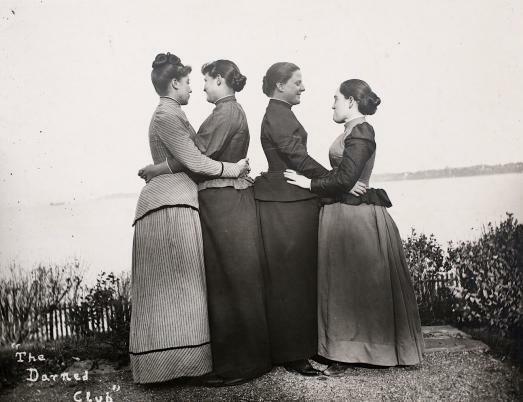 These images are among the oldest, if not the first, known where women appear in affectionate, even loving attitudes; there are not a lot in her collection but they are the ones that have transcended and have made Alice Austen an icon within the American LGBT groups. These and those of her great love: Gertrude Amelia Tate (1871-1962), a teacher and dance teacher who she met at the age of 33 and became her lifelong companion. 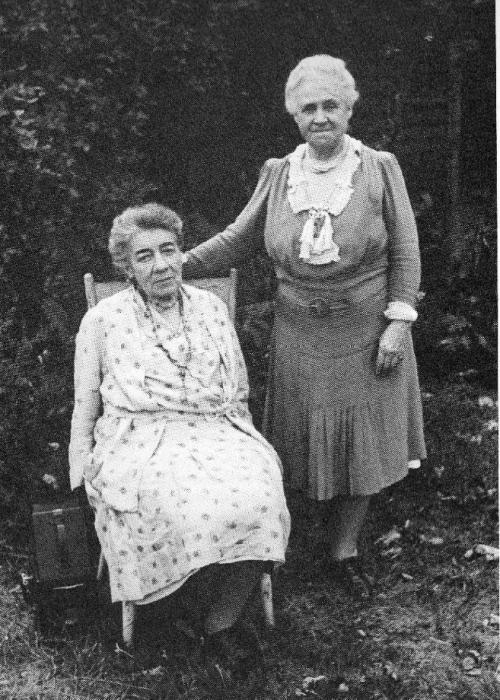 Together they lived at Clear Comfort since 1917, not hiding their lesbian relationship and going through harsh ups and downs, including strong opposition from their families; they did not even respect to buried them together. Parties, fancy-dress dances, meetings to have tea or play cards… they liked to have fun, to do sports, to go on excursions. Many of those moments were recorded with little awareness of the “inadequacies” that some of those images might provoke outside their most intimate surroundings. They knew they were taboo, yes, but in their mood they were not scandalizing but rather experimenting with mischief and even a certain naivety. Alice Austen was one of the first American photographers to go outside the limits of a studio, in fact she was never in one, although some of her photographs, which she took from her friends, do simulate games and theatrical performances. 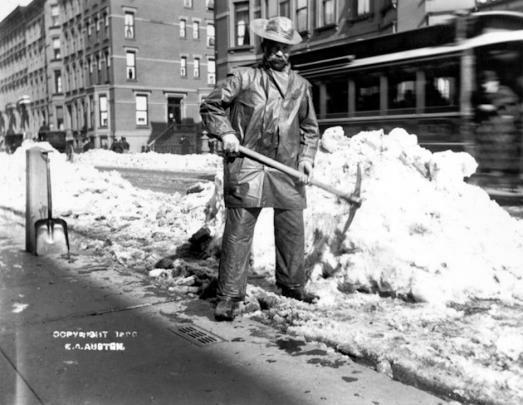 But there came a time when Alice’s curiosity asked for more space and from photographing her surroundings she went out to the streets of New York with her heavy equipment to photograph the life of a city that was changing rapidly at the turn of the century. Alice is a photographer of the daily life; as a whole, her photography is defined as documentary photography, what we would now call photojournalism, with a fresh and natural look. She didn’t seem to have any wishes of becoming a professional, she didn’t need to work, and even in the bad times she didn’t see photography as a way to earn a living, although it was the object of some commissions. As when she took an extensive series of photographs at the behest of Dr. Doty of the U.S. Public Health Service of “Quarantine Island” where sick immigrants were held before being admitted to the mainland. Or the peculiar work to illustrate a book by her friend Violet Ward (“Bicycling for Ladies”. 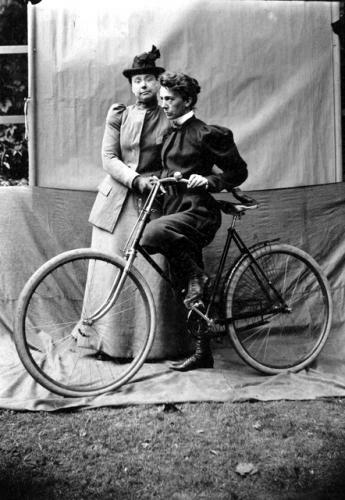 1896) where she showed how to ride a bicycle; it is not clear that she received any remuneration for these works. Another extraordinary series is the “Street Types of New York”. 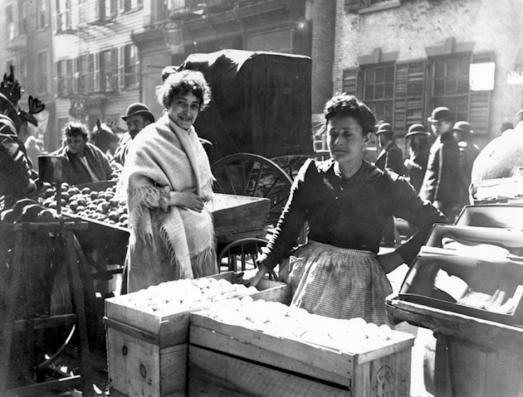 Unlike other urban photographers who worked in New York in the late 19th century, Austen did not set out to document deterioration or poverty, nor did she looked for the city most unusual inhabitants, focusing on photographing passers-by and working people. 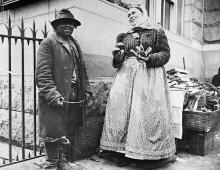 Street photos of travelers and immigrants at the docks, mailmen, shoeshine boys, street vendors, sweepers, guards… their “New York guys”. Few stolen photos, his models pose self-confident and without modesty in front of the camera in a conscious way, which gives these people a serene dignity, natural looking, the constant in her work; empathy for her models goes through the paper. 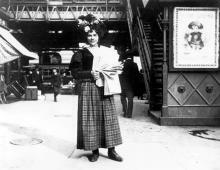 Some of these photographs were published in magazines and postcards. From the good old days to the crack of ’29. And so the years of prosperity went by; between photos, parties, trips around Europe, always with the cameras on top, living comfortably from the rents of her grandfather’s inheritance. Everything changes drastically in 1929 when the Wall Street crash wiped out her investments, and yes, the crash hit hard on the whole society, including certain sectors of the upper classes, although naturally not with the terrible impact it had on the working classes. 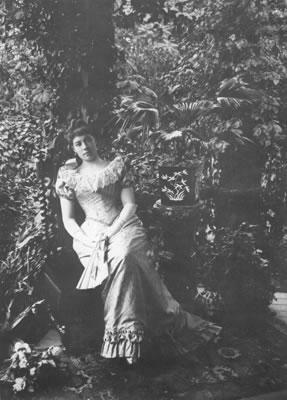 Alice had the resources to stretch her fortune, and she did it by selling the silverware, paintings or furniture of the mansion, they even set up together with Gertrude a tea room in the house, but with little success. The bills were accumulating, the property was mortgaged and finally lost in 1945, the year in which she was evicted; Alice was 79 years old. When she is forced to leave Clear Comfort, she sells everything that was left, but first asks Loring McMillen of the Staten Island Historical Society to help sort things out. Among all these items is his treasure trove of thousands of glass plate negatives that he kept and stored in the basement of the former courthouse in Richmondtown. Alice moves to a small apartment, and eventually to a nursing home. Meanwhile Gertrude’s family agrees to take her into their home, but only her, without Alice. 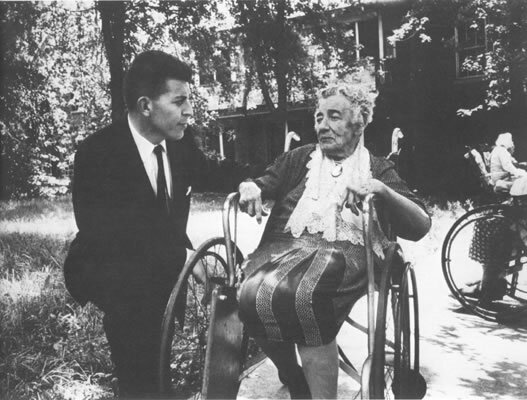 In 1950, when she could no longer afford to pay for her stay in that home, she declared herself insolvent and was admitted to a state home for the homeless elderly. In the fall of 1951 Alice was the guest of honor at the Richmondtown Museum for the inauguration of an exhibition of her photographs, which was called “Alice Day Austen”. In an interview, she said, “I’m happy because what once gave me so much pleasure now gives pleasure to other people. A year later she died peacefully in her sleep. It should be noted that Alice was a very methodical photographer, and her archive contains very precise notes in which she comments on the type of light or the time at which the image was taken, names, dates, places, or details that caught her attention like that note from a newspaper vendor’s photograph: “The splendid hats were also worn in the humble activities of life, even at work at the Sixth Avenue station. Today Alice would be proud and above all grateful to see the transcendence that her legacy has reached. No wonder, as the museum that her home has become today is an example of how to manage a fund of this category. It was almost lost in the 1960s due to real estate speculation but a group of citizens made a serious effort to save the house and the land. Restoration began in January 1984 and was completed in April 1985. Because of its historical importance, Alice Austen House was included in the National Register of Historic Places in 1970, and was declared a National Historic Monument in 1993. Alice’s photographs have made it possible to restore it with great accuracy. The various activities that take place in the museum deserve a special mention. Apart from the function of compiling Alice’s disintegrated work, there are temporary exhibitions in accordance with the contents of the collection, with such disparate themes as New York society, gardening and, of course, intense collaboration with American LGTB rights groups, such as the Pride Center of Staten island or the Stonewall Consortium; guided tours, didactic actions for schoolchildren, photography workshops and facilities for further research in the archive. In terms of funding, in addition to receiving public grants, they accept donations and sponsorships, starting at $10, and are rented for all types of events, such as weddings, book presentations or theatrical performances. Everything appears punctually on its magnificent website, which has been the main source of this article for both text and photos. The most difficult thing has been to select the photos that illustrate it, there are so many and so many suggestive images in her collection! But… don’t be shy, navigate Clear Comfort, it’s worth it. 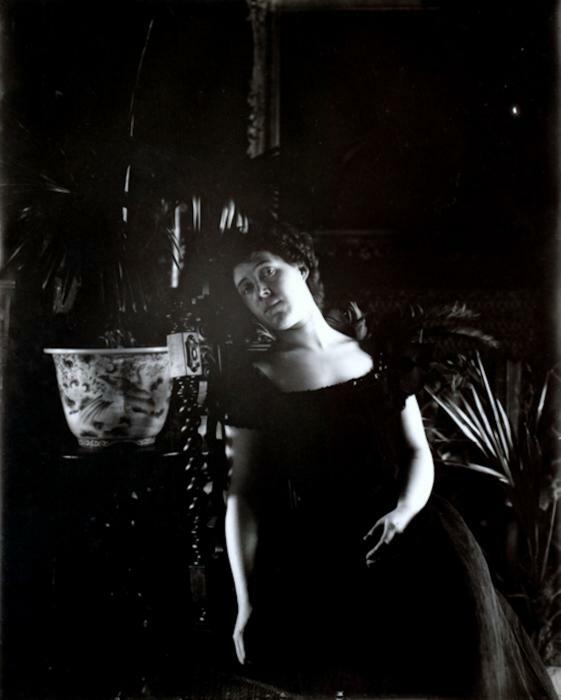 “The Positive Image: Women Photographers in Turn-of-the-Century America. Jane Gover. 1988 (a study of women photographers in America at the turn of the century) “Alice world” Ann Novotny. 1976. Alegría Lacoma Lanau, November 2018.